Books have been a pleasure for me this year. I didn’t write as many review posts as I would have liked to and I promise I will do better on that in 2018. One of the stand out posts for me this year was about what a well written book looks like to me, and though as I mentioned already I didn’t write nearly as many reviews as I should have, the year was still full of literature that kept me entertained and even a bit in my feelings. I love discovering new authors it just means that I have more new books to look forward to reading. Quite often when I find an author that I love I tend to read all that I can get my hands on to. She has a magic series called The Bane Chronicles, that takes place in another reality, as in not here on earth. The first book I read I wasn’t into that much but a few months after reading it I saw another one of hers and the blurb reeled me in. After that I had to go back and re-read the one that I initially read and then I found all the books that she had in the series, which I think is currently at 9. I think she built her characters well and they develop and progress through the stories, her plot isn’t weak, I can’t predict exactly what’s going to happen in the next scene and I’ve gotten invested in the characters lives, which to me is a sign of a good book or a good author. I started at the end with this one. Kate writes about Vampires - The Last True Vampire, though not the Twilight variety. I read the then last book in the series and wanted to know more, so I read the other books and then sought out any new books that were released. The series just captured my attention. I like when authors write about vampires in a way that isn’t stereotypical like oh my gosh he’s allergy to garlic, can we please come up with something new. i think that Kate’s take on vampires mixes enough new with the old that it doesn’t feel like something you’ve already read. D.B was the standout new author this year for me. She also has a vampire series - Vampires In America, but it’s oh so good. There’s currently 11 or 12 books in the series with a few novelettes thrown in there. I just plain enjoy her writing. I always enjoy when an author can write a strong female lead character that isn’t diminished by her love interest, and D.B does a great job of that. Each of the female protagonists in each book are multi-facetted and contribute something to the development and growth of the story line as opposing to just be arm candy or a side piece. As I was compiling my list for books that made it to my favourites list I realized that only two really stood out to me. I read a lot of books this year but these are the ones that I remembered the most. This book focuses on Silver Mercant a Psy and her relationship with a Changeling bear Alpha. As with most of Nalini’s books I enjoyed it and have re-read it about 3 times already. The story to me is well developed and as it moves towards the climax really tugs at your emotions, you want everything to work out but it looks like it might not. Even though this is a paranormal romance you really couldn’t predict what would happen around the corner. It’s a good read for those that are already familiar with the series and I would highly recommend her as an author, though you might want to start with the first book in the Psy-Changeling series to get your bearings. I am a big fan of Patricia Briggs writing and I found this latest instalment in the Mercy Thompson series to be just as good as her other books. This book had a few surprises that though they were simply, truly caught me off guard. This was another book that I re-read. Patricia Briggs always does a good job with laying the ground work for the plot so when the climax hits it doesn’t feel rushed or hurried. It reaches the crescendo in a gradual climb. 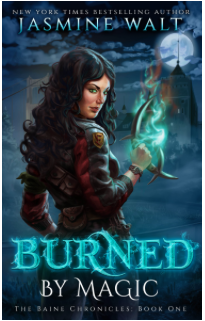 Another author that I would recommend if you’re into urban fantasy. This heading might seem strange, but this year was the year of re-reading. I doubled back quite a few times when the pickings got a little slim with new releases that I was interested in. So I went back to some books that I enjoyed the first go around and even some that had me scratching my head a bit. I’ve mentioned her already in my earlier post this year where I first started talking about re-reading books. For some reason she just draws me in, her books are like those drama shows on TV, you know that the script is that good and that things are staged yet some how you still find yourself watching. This is me with Kathy Barton books. I discovered Suzanne last year and fell in love with her writing, her series and her characters. These books I re-read for the enjoyment. She writes in the urban fantasy, paranormal realm as well so you have your vampires and werewolves, demons etc. She also doesn’t write her characters with the typical traits, some things are similar but there is enough change and nuance that you don’t feel like you’re reading every mainstream vampire book. I’ve read many of her books through the years so although the story lines and characters can start to follow a set pattern there’s enough variation between series that it isn’t annoying. With a catalogue with hundreds of books, it’s fairly easy to find something to re-read and enjoy. Even though I’ve read pretty much every book that Nalini Singh has written I can’t say that I’ve found them repetitive or formulaic. I always enjoy reading one of her books and look forward to what she has coming out in 2018. Like Nalini, I’ve mentioned her in my favourites and enjoy reading what she writes. This year I’m going to try and find some of her lesser known books and read some of those while I wait for the new releases that she has coming out. What authors had you smiling this year as you read through their work? Which books made it your favourites list for 2017?